Need a quiet, meaningful, and engaging activity for students to do while they settle in each morning? Check out my Common Core aligned Morning seat work preview for FREE! It helps students tackle the common core core in a fun daily Math and ELA review. It contains 1 page from each month's packet. If you love it as much as everyone else did, you can purchase them month by month or save on the bundle! Check it out!! AFTER YOU DO, PLEASE LEAVE ME SOME FEEDBACK!!! 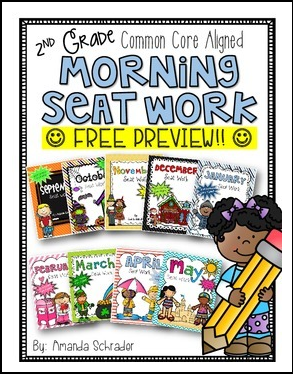 Common Core Morning Seat Work Yearlong Bundle!